So why don’t more techs incorporate regular hand-washing into their routine? One reason: Many nail techs believe that the nails will absorb moisture if clients wash their hands prior to the service, negatively impacting adhesion. The fact is, however, that nails begin to absorb moisture only after soaking in liquid for longer than 60 seconds; most clients only wash their hands for about 10 seconds. “Misinformed veteran nail educators teach their students not to wash their clients’ hands because it leads to lifting, but rather to file and rough up the nail plate as much as possible to promote adhesion,” says Schoon. Over-filing and buffing the nail plate to remove dirt, oil and buildup, however, isn’t effective, and can severely thin and weaken nails. “Another myth is that using hand sanitizer alone is sufficient,” says Schoon. “Sanitizer only kills some of the bacteria and doesn’t clean the nails or wash dirt away. The only time an alcohol sanitizer is effective is after washing.” For others, the obstacle to incorporating regular hand-washing into the routine is merely a matter of time. “When you’re booked back-to-back, minutes matter,” says Somer Adams, nail artist and owner of Nail Designs at LaBella Salon in Glastonbury, Connecticut. Incorporating hand-washing into your pre- and post-service routine doesn’t have to be time consuming, however. To overcome the awkwardness of asking clients to wash their hands, Adams suggests explaining that the oils left on hands and nails affect the way products perform, or walking to the sink with them so they know the technician washed her hands as well. She also recommends asking clients to wash their hands after checking in at the reception desk or while waiting for their services. At Los Angeles-based salon Two Brown Eyed Girls, hand-washing is the first thing clients do when they step inside. “We direct clients to our wash station before they have any manicure service,” says salon owner and chief operating officer Darrin Johnson. “We don’t conduct a nail soak because it bloats the nail. After the hands are washed, we sanitize the nails and use fresh files and tools.” The Two Brown Eyed Girls hand-washing station provides clients with access to warm water, a basic liquid soap and clean nail brushes to scrub underneath nails. Separate containers marked for clean and used brushes prevent cross- contamination. By making just a few modifications to your routine, it’s easy to incorporate hand washing into your salon procedures. When providing nail brushes to scrub underneath nails, use separate containers, one marked for clean and the other for used brushes, to prevent cross-contamination. 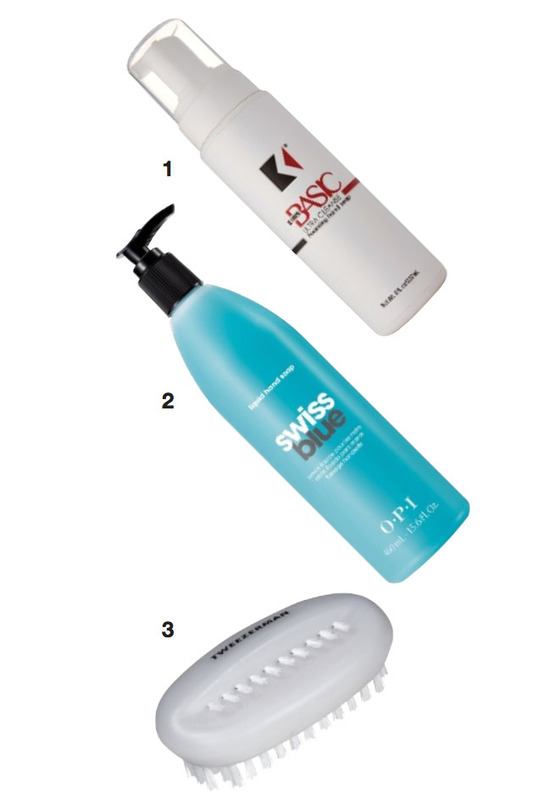 Add these must-have soaps and brushes to your salon services.